This article is about the river in the Czech Republic. For the symphonic poem, see Má vlast. For the restaurant in Helsinki, Finland, see Vltava (restaurant). The Vltava (/ˈvʊltəvə, ˈvʌl-/, Czech: [ˈvl̩tava] ( listen); German: Moldau [ˈmɔldaʊ]) is the longest river within the Czech Republic, running southeast along the Bohemian Forest and then north across Bohemia, through Český Krumlov, České Budějovice and Prague, and finally merging with the Elbe at Mělník. It is commonly referred to as the "Bohemian sea" and the "Czech national river". The Vltava river is 430.3 kilometres (267.4 mi) long and drains an area 28,090 square kilometres (10,850 sq mi) in size, over half of Bohemia and about a third of the Czech Republic's entire territory. As it runs through Prague, the river is crossed by 18 bridges (including the Charles Bridge) and covers 31 kilometres (19 mi) within the city. The water from the river was used for drinking until 1912, when the Vinohrady Water Tower ceased pumping operations. It is, however, the source of drinking water in case of failures/repairs to the water supply from the Želivka and Kárané sources. The Podolí water processing plant is on standby for such cases with the long section of the river upstream of the Podolí plant under the stricter, second degree of pollution prevention regulations. Several dams were built on it in the 1950s. The Orlík Dam supports the largest reservoir on the Vltava by volume, while the Lipno Dam in the Bohemian Forest (Czech: Šumava) retains the largest reservoir by area. South of Prague the Štěchovice Reservoir has been built over the site of the St John's Rapids. The river also features numerous locks and weirs that help mitigate its flow from 1,172 metres (3,845 ft) in elevation at its source near the German border to 155 metres (509 ft) at its mouth in Mělník. The height difference from source to mouth is about 1,016 metres (3,333 ft) and the largest stream at the source is named Černý Potok (Black Brook, AKA Teplá Vltava). The Vltava itself originates by a confluence of two streams, the Warm Vltava (Teplá Vltava [cs]), which is longer, and the Cold Vltava (Studená Vltava), sourcing in Bavaria. 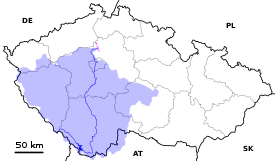 Along its course, Vltava receives many tributaries, the biggest being Otava and Berounka from the left and Lužnice and Sázava from the right side. Its section around Český Krumlov (specifically from Vyšší Brod to Boršov nad Vltavou) is a very popular destination of water tourism. Both the Czech name Vltava and the German name Moldau are believed to originate from the old Germanic words *wilt ahwa ("wild water"; compare Latin aqua). In the Annales Fuldenses (872 AD) it is called Fuldaha; from 1113 AD it is attested as Wultha. In the Chronica Boemorum (1125 AD) it is attested for the first time in its Bohemian form, Wlitaua. The Vltava basin has flooded multiple times throughout recorded history. Markers have been created along the banks denoting the water line for notable floods in 1784, 1845, 1890, 1940, and the highest of all in 2002. In August of that year, the basin was heavily affected by the 2002 European floods when the flooded river killed several people and caused massive damage and disruption along its length, including in Prague. It left the oldest bridge in Prague, Charles Bridge, seriously weakened, requiring years of work to repair. Prague was again flooded in 2013. Many locations within the Vltava and Elbe basins were left under water, including the Prague Zoo, but metal barriers were erected along the banks of the Vltava to help protect the historic city centre. Nine hydroelectric dams have been built on the Vltava to regulate the water flow and generate hydroelectric power. 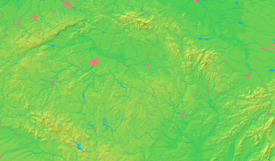 Beginning at the headwaters, these are: Lipno, Lipno II, Hněvkovice, Kořensko, Orlík, Kamýk, Slapy, Štěchovice and Vrané. One of the best-known works of classical music by a Czech composer is Bedřich Smetana's Vltava, usually called The Moldau in English. It is from the Romantic era of classical music and is a musical description of the river's course through Bohemia (listen). A minor planet 2123 Vltava discovered in 1973 by Soviet astronomer Nikolai Stepanovich Chernykh is named after the river. Smetana's symphonic poem also inspired a song of the same name by Bertolt Brecht. An English version of it, by John Willett, features the lyrics Deep down in the Moldau the pebbles are shifting / In Prague three dead emperors moulder away. ^ "Vltava" (US) and "Vltava". Oxford Dictionaries. Oxford University Press. Retrieved March 31, 2019. ^ "Vltava". Merriam-Webster Dictionary. Retrieved March 31, 2019. 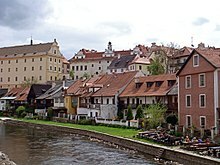 ^ a b "The Vltava River – Historical Communication Link in the Český Krumlov Region". Český Krumlov – UNESCO World Heritage. Retrieved 19 June 2015. The length of its flow to the mouth of the river to the Labe river near Mělnik is 430.2 km. Down to Český Krumlov it has a catchment area of 1,339 km2, the whole basin of the Vltava river is 28,090 km2. ^ Šmilauer, Vladimír (1946). "O jménech našich řek" [Names of our rivers]. Naše řeč (in Czech). Institute of the Czech Language. 30 (9–10): 161–165. ISSN 0027-8203. ^ Papadaniil, Sofia; Schütze, Susann; Alukwe, Isaac (16 September 2007). "I. Flood Protection Measures of the City of Prague". Technische Universitat Dresden. Retrieved 19 June 2015. Several flood marks along the river show the water levels of the different events in history and try to keep this danger of flooding in mind of the people. ^ a b Yates, Ricky (9 February 2010). "Flooding in Prague". Ricky Yates – an Anglican in Prague. Retrieved 19 June 2015. ^ Yates, Ricky (15 April 2012). "The Vltava River". Ricky Yates – an Anglican in Prague. Retrieved 19 June 2015. ^ Bond, Anthony (4 June 2013). "Prague under water as floods claim ELEVEN lives across Europe and threaten German city of Dresden". Daily Mail. Archived from the original on 7 June 2013. Retrieved 19 June 2015. Areas to the south and north of the Czech capital were submerged, including the city's zoo and horse racing track, in the worst flooding in a decade which followed days of heavy rain. But metal barriers erected along the Vltava river banks protected the historical city centre. ^ Schmadel, Lutz D. (2003). Dictionary of Minor Planet Names (5th ed.). New York: Springer Verlag. p. 172. ISBN 3-540-00238-3. Retrieved 2009-10-09. ^ "The song of the Moldau". Anti War Songs. 21 August 2012. Retrieved 25 September 2013.